Students explored the Eight Standards for Mathematical Practice (SMP) at the MfA SD Math + Leadership Camp in San Diego this summer. San Diego County kids had plenty of exciting summer camps to pick from this year, but only one balanced learning proportional reasoning in math with geocaching on a college campus, rock climbing in Escondido and kayaking off the Oceanside pier. 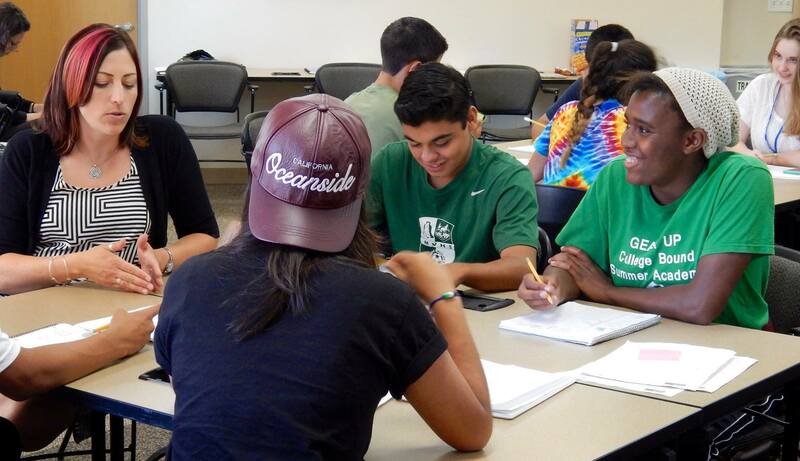 The Math for America San Diego Math + Leadership Camp was a 10-day summer camp for 9th-11th grade students from Oceanside Unified School District and Vista Unified School District. Held in July at CSU San Marcos, the camp featured a mathematics class in the morning and leadership and team building activities in the afternoon. Designed by Math for America San Diego (MfA SD), the all-day camp was a collaboration among CSU San Marcos, Oceanside Unified School District (OUSD), Vista Unified School District (VUSD) and arc, an afterschool and experiential education provider. Housed in the Center for Research on Educational Equity, Assessment and Teaching Excellence (CREATE) at UC San Diego, MfA SD works closely with county school districts to develop and deliver high quality, mathematics teaching and learning programs to mathematics teachers and students. MfA SD, in conjunction with UC San Diego’s CREATE STEM Success Initiative, focused the summer work on helping students regain their enthusiasm for mathematics while enjoying some outdoor activities. 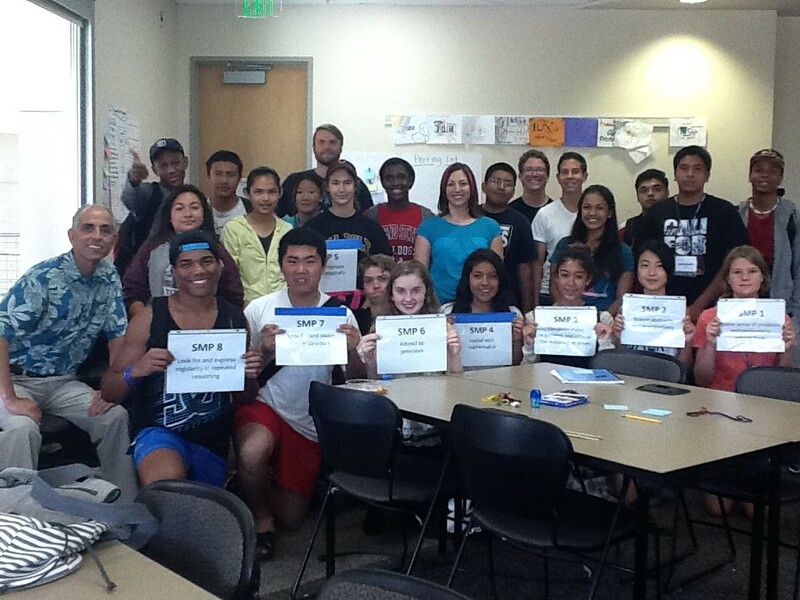 In past summers, MfA SD held mornings-only math academies. This year, the program wanted to expand to an all-day camp experience combining mathematics learning with more traditional summer camp activities. Encouraging a college-going mindset among students was also a goal of the Math + Leadership Camp experience. Dr. Manuel Vargas, director of CSU San Marcos School of Education and MfA SD executive committee member, offered space at CSUSM’s Kellogg Library to hold the Math + Leadership Camp. He welcomed Math + Leadership Camp students to the university on opening day and arranged a campus tour, presentation and discussion on university admissions for the campers. 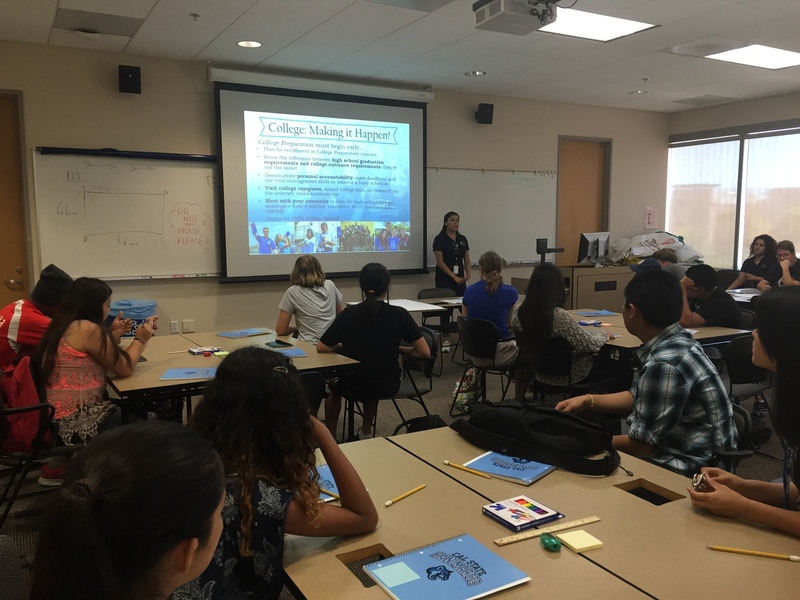 A student representative talks with students about college readiness and admissions to CSU San Marcos. 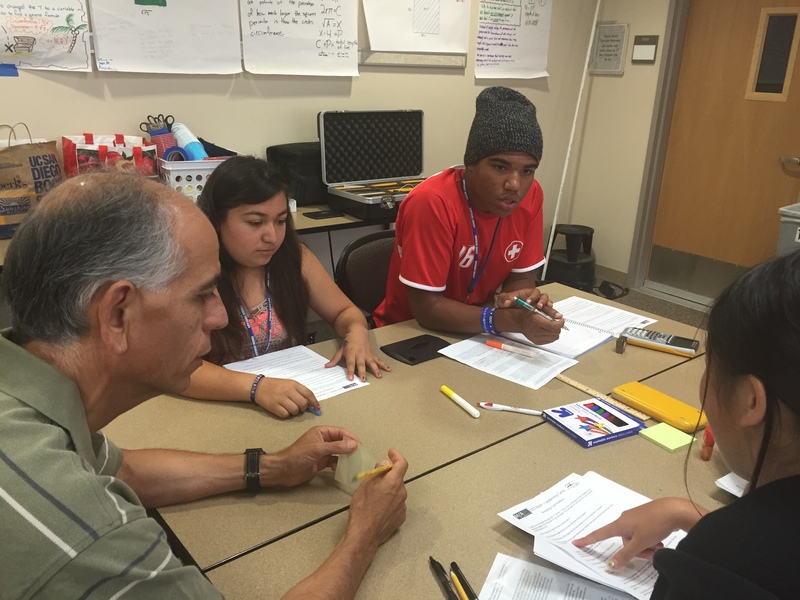 Developing students’ understanding of the eight mathematical practices in the Common Core State Standards was key, said Gregory Guayante, MfA SD Master Teaching Fellow and Math + Leadership Camp instructor. The camp mathematics class focused on proportional reasoning, an important concept for a solid understanding of algebra, geometry and more advanced math. Students learned about the Standards for Mathematical Practice (SMP) for the Common Core State Standards to help them approach and solve math problems. Math + Leadership Camp teachers included MfA SD Fellows Scott Frazier, mathematics teacher at Kearny High – School of International Business, Gayle Kovacevic, mathematics teacher at Escondido High School (both pictured here); and MfA SD Master Teaching Fellow Gregory Guayante, mathematics teacher at El Camino High School. 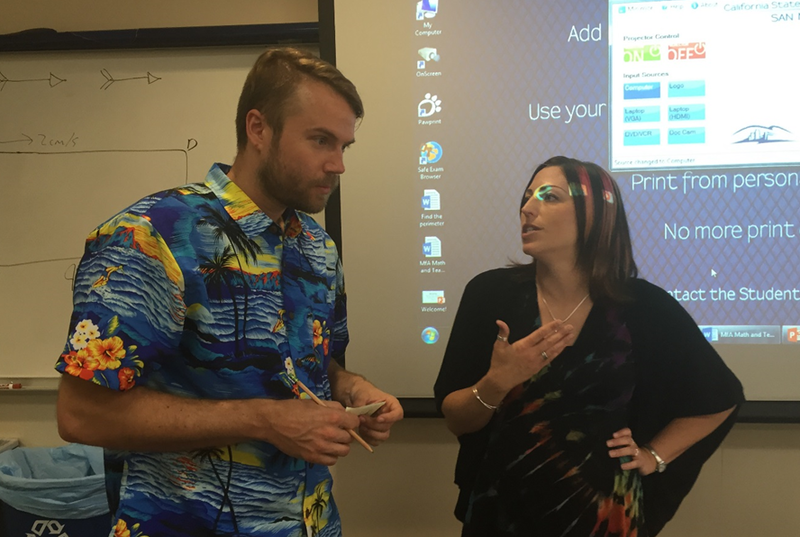 Frazier and Kovacevic are alumni of MfA SD’s Teaching Fellowship program, a five-year professional development program for new middle and high school mathematics teachers. Guayante will complete his five-year Master Teaching Fellowship for experienced and exemplary mathematics teachers in June. Curriculum planning for the Math + Leadership Camp provided “academic freedom with a purpose,” said Guayante. “Scott, Gayle and I enjoyed the ability to select the topics and problems for the math camp that were perfect for these students. Working together, we had the freedom to improve our mathematical teaching practices, focus on what makes good teaching practices, and talk about the pedagogy. We wanted to create a mathematically rich experience for students that would inspire confidence moving into next year’s mathematics class. And as secondary mathematics teachers, we knew what would help students next year. Students paid more attention, knowing this class was relevant to what they would be doing in their next math class and that it would help them to become better students,” Guayante added. “We explicitly kept talking about the eight Standards for Mathematical Practice (SMP), asking students to identify which practice they were using. Were they attending to precision? Could they find and make use of structure? Consciously getting to know the SMP helped students make sure they were complete in their thinking,” Guayante said. To help support the camp’s overall mathematics and leadership approach, teachers integrated their own team building activities into class. During “team building breaks,” students worked together to build the tallest tower using paper and paperclips, learned to silently communicate how to find and pick up plastic bugs scattered on the floor, and, as a class, to balance and lower a pole resting on each of their index fingers without dropping it. Integrating the more casual activities into the math class brought students closer together so everyone felt included and more comfortable asking questions, sharing, and problem solving with each other (see student comments below). “The thread running throughout each day was leadership, team building and problem solving. The contrast between the academics of mathematics and learning the sport of rock climbing was a balance of formal and more informal learning – with purpose. Between the morning and afternoon sessions, Math + Leadership Camp students benefited from a very well-rounded educational experience,” Guayante said. The best part about math camp was being able to learn beside people who think differently. Doing morning warm up problems. Visual ways to look at problems. Seeing everybody able to have fun and civilly discuss problems we would come across without any rude comments or gestures made to one another. Figuring out complicated math problems. Had fun solving them. I liked the first problem we worked on because it was challenging but not super hard. Plus I had a good group that was willing to explain things to me. I had fun and made some new friends who had my same interest in math. Caused me to increase/expand my mathematical ideology! Math class was usually my favorite part of the day. Does well at preparing for high school level classes. Our math class was so fun, every day was amazing. I loved how our class had a special bond, hope to see them soon. Understanding the math we used even though I hadn’t covered it before. Discussing our different understanding of various words or methods of solving a math problem. Overall, the whole experience was amazing; I hope to do it next year. If offered again, I would send my child to the Math + Leadership Camp. She talked to me about how much knowledge she was developing in her math skills and leadership skills. She would always come home happy and tell me how fun it was meeting new people and how nice everyone one was. I believe this is an excellent program for students. Thank you for everything. Hope my daughter can join the Math + Leadership Camp again next year. It changed my child from passively learning to proactively learning.